Professional Extensions & Services for Joomla! 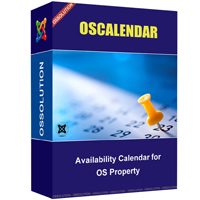 OS Calendar work with OS Property, so you should have OS Property (version >= 2.0.3.3.0) installed. After that, you can manage the rental information for each your property. Agent can manage those information from the frontend. 1. Rental information: They are important information for reservation. It includes default price, tax, deposit amount, payment method or auto approval the booking request. 2. Special prices: If you have the special price for the holiday or something like that, you can manage them from this task. 3. Avaiability Calendar: In this page, you will have the general view about the availability for each property. You can see the days that the property has been booked, the days that property is not available. You can also manage the available/unavailable status of the property in each day. OS Calendar has the default menu "Booking list". This menu is for agents. It list all the booking requests of properties of agents in the frontend. From frontend, agents can manage the rental information of their properties like in the backend. 2. Make sure that you have the latest version of OS Property. Go to backend > OS Property > configuration. Select to integrate with OS Calendar. Copyright © 2013 -2018 Joom Donation Extensions. All Rights Reserved. joomdonation.org is not affiliated with or endorsed by the Joomla! Project or Open Source Matters.